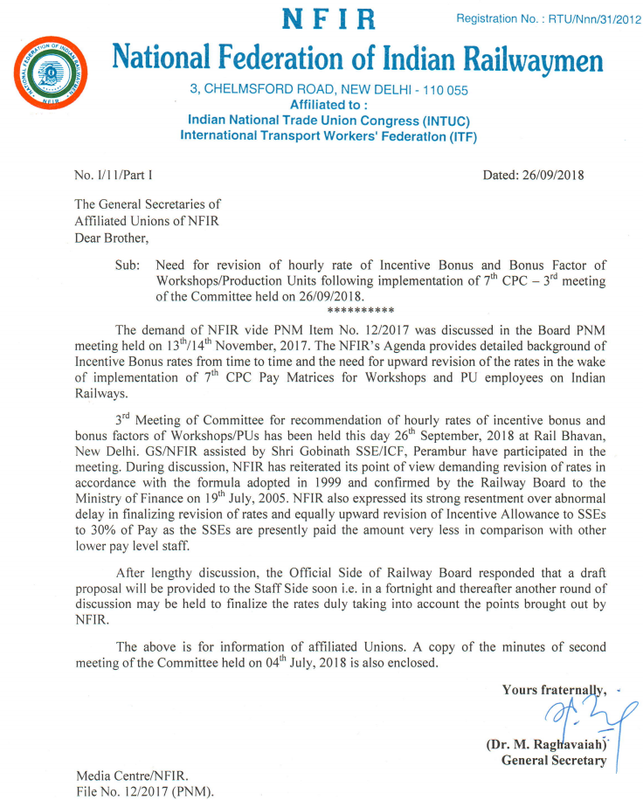 Sub: Need for revision of hourly rate of Incentive Bonus and Bonus Factor of Workshops/Production Units following implementation of 7th CPC - 3rd meeting of the Committee held on 26/09/2018. The demand of NFIR vide PNM Item No. 12/2017 was discussed in the Board PNM meeting held on 13th /14th November, 2017. The NFIR' s Agenda provides detailed background of Incentive Bonus rates from time to time and the need for upward revision of the rates in the wake of implementation of 7th CPC Pay Matrices for Workshops and PU employees on Indian Railways. 3rd Meeting of Committee for recommendation of hourly rates of incentive bonus and bonus factors of Workshops/PUs has been held this day 26th September, 2018 at Rail Bhavan, New Delhi. GS/NFIR assisted by Shri Gobinath SSE/ICF, Perambur have participated in the meeting. During discussion, NFIR has reiterated its point of view demanding revision of rates in accordance with the formula adopted in 1999 and confirmed by the Railway Board to the Ministry of Finance on 19th July, 2005. 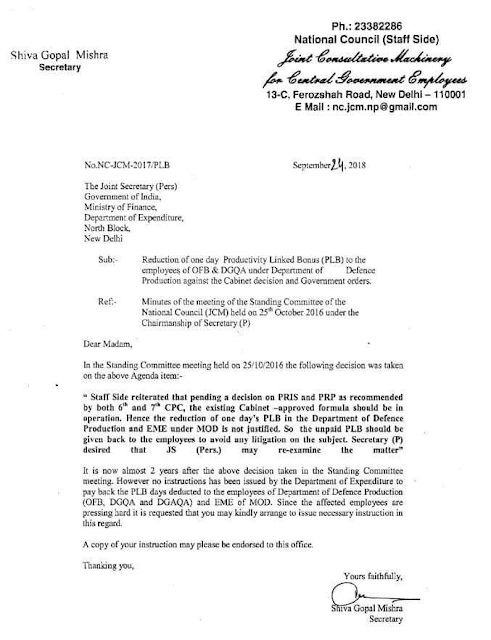 NFIR also expressed its strong resentment over abnormal delay in finalizing revision of rates and equally upward revision of Incentive Allowance to SSEs to 30% of Pay as the SSEs are presently paid the amount very less in comparison with other lower pay level staff. After lengthy discussion, the Official Side of Railway Board responded that a draft proposal will be provided to the Staff Side soon i.e. in a fortnight and thereafter another round of discussion may be held to finalize the rates duly taking into account the points brought out by NFIR. The above is for information of affiliated Unions. A copy of the minutes of second meeting of the Committee held on 04th July, 2018 is also enclosed. 2. It is seen that the Railways have been experiencing difficulty in implementation of these instructions due to reliever(s) not being readily available in the Engineering Department. This has been considered by the Board. In order to ensure viable implementation of these instructions, it has been decided that henceforth 10% of the proposed intake for recruitment in Level-1 (erstwhile Group D) of all those departments where there is provision of induction of Trackmen against 10% quota, will be clubbed to recruit equivalent number of Trackmen in addition to the intake of Trackmen decided for the Engineering Department. 5. Applications for lateral transfer of Trackmen to other departments should be called for department wise and applicants shortlisted on basis of seniority based on the length of service. Separate applications should be submitted for each such The complete list of applicants should be displayed and also placed on the web page of the division. It is reiterated that for transfer to other departments, a Trackman/Gangman should be suitable in all respects including possessing physical standards prescribed for recruitment to that Department/Workshop.